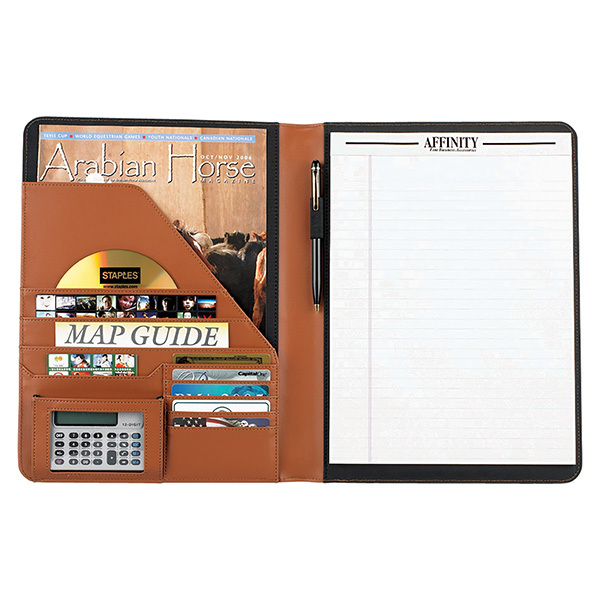 Bring new business into the fold during the next promotional campaign with help from the Franklin Leather Desk Folder. Measuring 9 3/4" x 12 3/4" x 5/8" and available in black, this essential pad folio features a padded cover, a rich microfiber lining, five card pockets, a pen loop, a CD pocket, a calculator pocket, double-turned French Edge styling and a 50-page ruled writing pad. Ideal for students and professionals, it can be customized with an imprint of your company logo and message for increased brand visibility. Case Dimensions 11" x 13.75" x 13.875"